I've been using CosMedix for over 2 yrs. i really like Lightning. I got dramatic result from it. I ran out of the bottle but my salon had to order it in. So I try Define. Omg, only 4 times using it i love my skin tone & texture. So smooth so nice. During that 4 times using it I was on it 1 day then off 3 days then, off another 2, then 1 day then I use it everyday. Until day 10 I still can see my skin so very nice but when I put makeup on it is so cakey. It doesn't look flawless anymore. It starts to red & itch. Then after 3 weeks my skin started to flake off around my nose bridge, nose and side of my cheeks near my nose. I then stop for 1 day. It doesn't look red now but a little itchy. Skin doesn't look smooth anymore after makeup. My skin look so shiny on my cheeks bone then usual. I'm not sure it supposed to be red & flaky for few weeks then it will be nicer or not. I'm not sure if that means my skin cannot tolerate it. I still recommend this coz different skin are different. Might work on yours. I was introduced to this product at a medical day spa and love it! A little tingle lets you know it's doing the job! I was totally new to any type of retin-a product and my esthetician recommended this to address some wrinkles I started to develope on my chest. (Yes...I was a sunworshipper who grew up in sunny California in the 70's...who thought SPF was uncool!) I was surprised at what a difference it made...especially to the texture of my skin. It became like that of a baby. Seriously! I would just sit and pet my skin. It didn't make my wrinkles disappear...however, it did make them appear less deep. As with any product you do have to be consistent. I will say that a little goes a long way...as it IS retin-a and is powerful. I've made the mistake and slathered it on a little too thick and felt the wrath for a good 2 weeks. This has now been added to my skin care routine. This product feels great to the touch and leaves my face and neck feeling moisturized and soft. I have been using define for about 3.5 years. I use it nightly, and as one review said your wrinkles are still there, but your skin is more smooth. The deep lines I don't have yet and Im almost 50. I wish I started to use this product in my 20's. I highly recommend it. I use the purity solution face wash which almost moisturizes my skin before apply the cream at night. If you find your skin is getting to dry try only washing your face at night. As we age are skin naturally looses moisture. I alternate this product with Serum 16 at night. I have had coworkers comment on my skin! I love how this product makes my skin look and feel. The next morning my skin looks clear, bright and even. Very expensive, but worth every penny! I apply this product every night after using purity clean. I love the way it makes my skin glow , minimizes my pores and evens out my complexion. I am in my mid forties and most people think I am still 35. I will continue to use purity clean and define for years to come! This product makes my skin very smooth and soft. I will contine to buy it even though it is a little pricy. i been a cosmedix costumer for almost a year now and the Define is the best. It helped a lot with my old acne scars. I am very happy about this product.I loved it the first time I used it, and still loving until now. As a California gal, the sun and surf are hard to avoid. As a 60-year old, I want my skin to be healthy and young looking if possible. My skin care professional used a CosMedix product on me and I was happy with the result. So I slowly starting switching to CosMedix 8 months ago and I can report that the products are the most effective I have ever used. And I have used many expensive and well-known products over the years. I have skin that is dry, and sometimes sensitive, so I'm careful about my products. 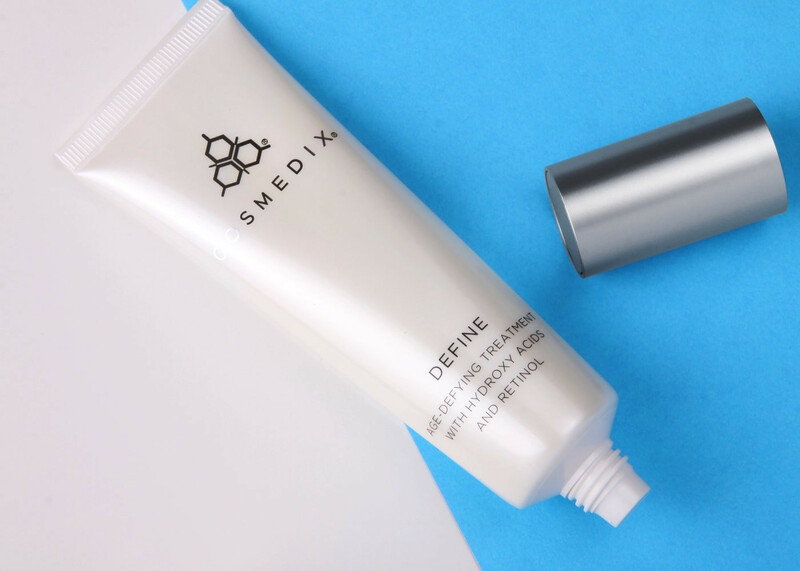 I started out using non-retinol CosMedix products but since I added Define as my nighttime go-to product, my skin has dramatically improved in texture, lines are finer and, most important -- I can see the positive difference. Define took my skin to a new level of healthy. Use a little and it lasts making it a good value. I first started using Define when I purchased a special kit from Jill's Steals and Deals, and boy am I ever glad I did! Within one week, I could tell a drastic improvement in the tone of my skin. Many of the sun spots and acne scars I once had have dissappeared. I will definitely continue to use this product and would recommend it as well. After avoiding retinol nearly 2 years (pregnancy and nursing) It's so good to have it back! I am a religious Cosmedix user, but I had to give up my Define when I became pregnant. Now that I started it again, only a couple weeks ago, I feel like I have a new face. My skin feels so smooth and hydrated, and I love that tingly feeling when I put it on. Good stuff! Can't live without this product!!! Since I was a teenager I have struggled with oily blemished skin. I am now 31 and wish I would have found Cosmedix years ago!!! I especially love this product, define. I apply it each evening, and after just 2 weeks of use, my superficial acne scars are disappearing, and also a few discolorations are no longer there! i absolutely love this product and I know you will love it too. I've been using this for a little over a month (first time using Cosmedix) and I'm impressed with the immediate results and feel of this product. It is light and there is a slight tingle, but it's not overly drying as other exfoliating products...in fact it almost feels slightly hydrated after I put it on my skin. My skin is smooth and healthier each day! This product has been a life changer! 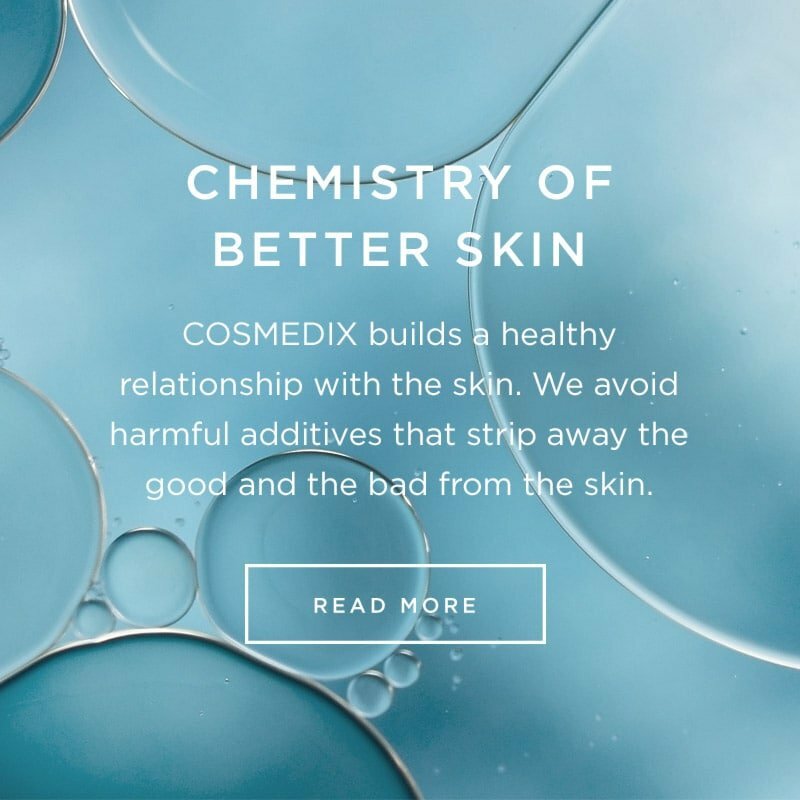 I suffer from adult acne and it has gotten worse over the years until I started using Cosmedix, especially the Define. My skin looks smoother and softer. My acne scars are also starting to disappear. It also lasts a long time since a little goes a long way. I was recommended Cosmedix Define by my dermatologist. I had adult acne, pigmented scars and my skin was dry from using harsh products.I have been using Define for 4+ years and my skin is clear of scars, visibly supple and youthful. I saw results within the first 2 weeks of use.I have next to no breakouts and my skin tone is even and smooth.Define is great value and one jar lasts me 12+ months. I apply very sparingly at night and always wear sunscreen - as my skin becomes more UV sensitive with this product.I cannot recommend Define highly enough. I have been using Define for seven months now. I can't believe how much better my skin looks. I am 52, and my skin had become dull with several dark spots. Define, along with proper cleansing, has faded all of the brown spots! Amazing! Have been using this product for a month and loving it. It has help tame my adult acne and leaves my skin well hydrated. I first used this product after having a facial. The technician used it on me and recommended some COSMEDIX products for my ROSACEA skin condition. I have used the AFFIRM and other products for 2 years and my skin is the best it has ever looked. I get so many compliments on how great my skin looks and I feel so great not only because it looks good but because I look refreshed and not tired looking all the time. I threw all the other cleansers and moisturizers out and only use COSMEDIX now. "Define" has surpassed all of my expectations. Immediately my skin felt softer and less dry. The product refreshed and hydrated my skin, leaving me feel more confident. No more dry patches for me! Started using cosmedix after a spa visit. I love all of the products but definitely saw a big difference after using Define for a couple of weeks. It is now part of my routine 3 or 4 times a week. I love when people tell me how great my skin looks. Fantastic for keeping skin youthful, reduces fine lines. Love this! I have used this over the past two years to resurface my skin and find that it does more. It seems to make my skin show a new glow! I love it! worth the extra step before bed! I received this product from my medical spa after a facial and have been hooked ever since. I have spent some time in the sun during my teen years and I'm only 25 but I had dark freckles developing on my face. After using the vitamin A treatment consistently before bed my skin texture and pigment has smoothed out considerably. If you want a youthful smooth glow back I recommend this product! Very impressed with this product-my skin was immediately more balanced and texture was just. I have very very sensitive skin and this product worked well. Would definately buy again! I use this nightly, after cleansing. My pores stay clear, and blackheads have all but disappeared completely.